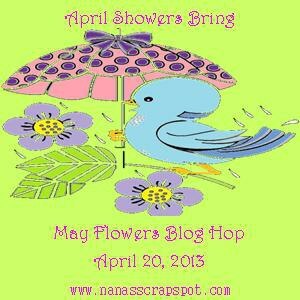 Welcome to the "April Showers Bring May Flowers" Blog Hop! We're so happy you could join us today! You should have arrived from Patti. If you happened by my blog or are joining me from your dashboard, head over to Miranda's blog to start at the beginning. We don't want you to miss any of the fun! We will be showcasing Spring like projects or projects with a rain or flower theme! In addition to seeing a lot of awesome creations, there is some blog candy available too. Miranda will be giving away a gift card from either Michael's or JoAnn's (winner's choice). To be eligible for the blog candy, you are required to visit each stop in the hop and leave a comment! The winner will be announced Wednesday, Apirl 24th on Miranda's blog! I really thought this chick was just adorable when I saw it on Lori's @ got2bcrafting blog. I knew I had to make a card using it. When I found the theme for this hop was April Showers Bring May Flowers, I knew this was the image I was going to use!! Tara, your card is so adorable! Your chick card is adorable! Love all those pretty spring colors. TFS. Tara! This is so super adorable!!! LOVE the cutie chick and that adorable face!! I love your card!!! Love all the layers and that sweet chick!!! You inspire me to want to make cards!!! Super Duper Cute! !your chick is Stink cute!! Very pretty, love that little cloud! Over the top with cuteness!!!!!!!!!!!!!!! Love her chubby little feathered body.I must use embossing next time on my clouds...looks great! What a super sweet card! The cloud paper provides a perfect background. The little cute feathered friend with the umbrella just puts a smile on my face. And of course, the embossingon the cloud is wonderful!! Awesome card. I love the colors and the little bird's face is adorable. Such a happy card I can't help but smile. love this! saw it on facebook this morning =) Just getting a chance to finish hopping though! Love this card! The colors, the balance. Great job. So much fun being on this hop with you. Oh my gosh, this is so adorable! I love the pattern papers and of course that cute chick:) She is so stinken cute!! Sweet card and the chick is so cute. So cute! This cut is so perfect for a Peachy Keen Face. Your card came out so SUPER CUTE!! I LOVE the pattern paper you chose for the umbrella... it looks amazing! :) Great Job on this Tara!! Very sweet card Tara. Love the pattern papers you used. Adorable! I lust love that darling little chick! 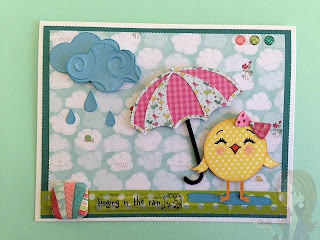 Very cute card--love the chickie and the papers you used. Tara, this is super duper cute!!!! Love, love, love the little chick! Thanks so much for hopping with me. I apologize for the lateness of the bloggie love, life sometimes gets in the way of all my fun! Just stinkin' adorable! Thanks for playing along with us at PeachyKeen! Congrats on making top 3 on Peachy Keen my friend!! !